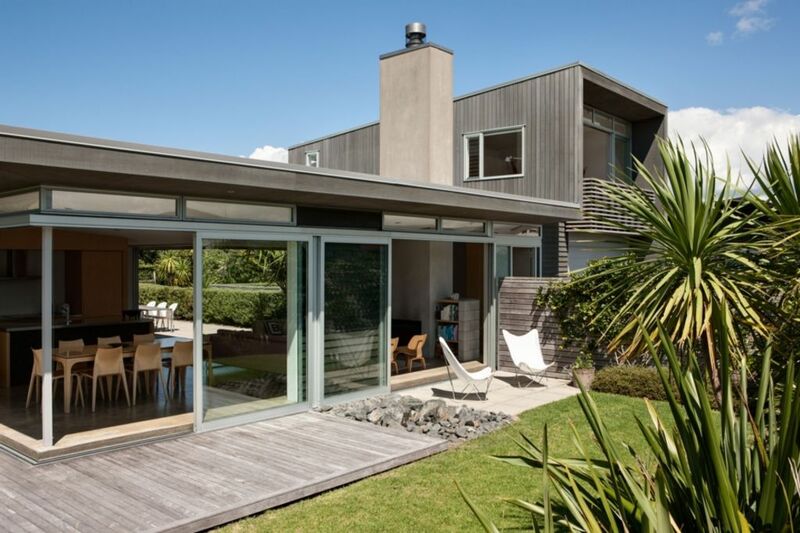 This architect's own beach house is located 100m back from stunning 4km long Omaha Beach. It is 40m from tennis courts and comes equiped with tennis racquets, 2 bikes, 2 kayaks and 2 surf boards. Large sliding glass doors open onto decks on one side and a sheltered courtyard and BBQ area on the other. The master bedroom has a view shaft of the sea and a pleasant outlook over Te Kie Point which terminates the southern end of Omaha Beach. The bunk room doubles as a second living area and has a large smart television with Netflix and a Bose sound bar - great for kids (of all ages). The built-in bunks are a special favourite with guests of all ages. The kitchen is well equipped and includes an espresso machine. The house is furnished with a mix of contemporary and retro furniture that recalls memories of earlier bach living. The minimum stay is one night during weekdays (that are outside of school holidays and preferably not attached to a weekend), two nights during the year, three nights over a long weekend and seven nights over the Christmas to New Year period. Arrival time is 4pm and departure time is 12pm (to allow for cleaning and servicing). We are open to accommodating your preferences so if you would prefer different arrival and departure times, just ask. Loved our stay in this particularly well designed beach house with lots of outside living areas. The kitchen was well equipped and the garage was full of toys. We especially liked the tennis racquets, which we were able to use at the nearby tennis court. We only stayed for the weekend but would love to come back and stay a lot longer.. Thank you. We love having guests who enjoy and appreciate the design and amenities of the house and make use of the toys -and tennis racquets. It's such a bonus having the courts so close. You are welcome back anytime. A very easy and relaxing placeto stay. Very welcome guests. A pleasure to have staying at the house again which was well looked after. Nice to have guests who enjoy the house and location. This architectural property has it all latest technology, best appliances and so close to the beach. Best of all are the owners who are extremely accomodating. Thank you.It was a real pleasure to have you stay and enjoy the house. We are pleased you had a lovely stay and many thanks for the lovely gestures of the cleaning of the BarBQue and Coffee machine-and attending to our fishing rods so they are in working order again. You are welcome any time .. Always lovely to have you staying at the house. Ideal location on cul-de-sac, 2 min walk to the beach, tennis courts and jungle gym, 10 min drive to town... house is very pretty, with private yard & patio and gorgeous landscaping. Owners were warm, communicative and generous! We would feel blessed to come back!!! Thank you for your lovely comments. We love it when people enjoy the house as much as we do. You are welcome back anytime.